Toshiba’s latest candy-bar camcorder looked like a great catch. But it comes with several catches. 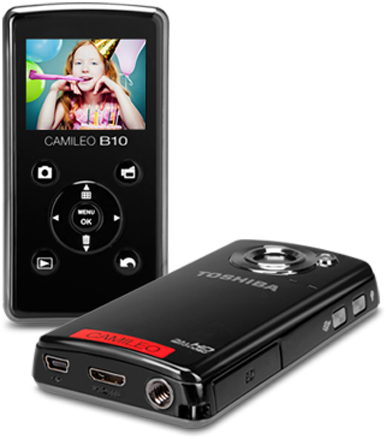 Toshiba Direct lists the Camileo B10 for $120, making it one of the more affordable pocket camcorders you can buy. It’s as small as a smartphone (4.3-by-2.2-by-0.7-inches at 3.8 ounces) yet shoots exceptionally sharp Full HD video in full light. It also comes with big-camcorder touches like a front-mounted video light for low-light shooting and some limited ability to tailor your shooting modes, including several settings for Scene and White Balance. It also comes from a company with a strong reputation for making a wide range of quality products from TVs to notebook computers. With such impressive creds, you may be tempted to snap up a few of these pocket models to shoot under the Christmas tree. Not so fast. We uncovered enough problems with the Camileo B10, a few serious, that we can’t broadly recommend it. Issues cropped up soon out of the box. This camcorder’s shiny black silver-trimmed plastic case is very slippery. Several times I nearly fumbled the unit. You’ll definitely want to use the supplied hand-strap. Especially since the case feels cheap and a little fragile, in particular the thin front panel cover, which easily pops off the camcorder body. That’s partly by design: The quick-remove cover makes swapping batteries a breeze. For a secure grip, we prefer Kodak’s PlaySport and PlayTouch models. Their lightly textured side surfaces provide enough friction to let you keep a firm grip on them. Toshiba didn’t quite finish working out the kinks. The camcorder once told me to format the already-formatted memory card for no apparent reason. I had to remove the card, turn the power off and on, and reinsert the card to get the unit to recognize the card. After repeated overnight charging, the Camileo B10’s most serious problem became apparent: It sometimes refused to turn on. At least a dozen times during my month with the camcorder, I had to remove its battery pack, let it sit for a minute, and reinstalled the pack before I could finally coax the thing to life. It often happened after I charged the unit, but at other times too. Toshiba sent me a replacement unit, which promptly presented the same problem. This can really cramp your style if you want to snag shots on the fly—a big reason why people want a pocket camcorder. The Camileo B10 performed very well when we shot in full light, rendering sharper and more color-realistic video than most pocket camcorders we’ve tested. But as the sun set, image quality faded even faster than the light. Shooting at the top resolutions around my neighborhood only a few minutes after sunset, video and still images became grainy, colors became very pale, and video image brightness and contrast started fluctuating. These effects occurred even with plenty of ambient light left, even though this model uses a backside-illuminated (BSI) CMOS sensor, which is designed to improve low-light shooting. The video light is a nice addition, but it works only for very tight shots, with the subject less than three feet away. During low-light tests, we also saw flashing blue lights in the video, unusual and unwanted artifacts. Looking at stills, the Camileo serves up JPEGs in three resolutions: 16MP interpolated, 5MP, and 3MP. I rarely saw any difference between 16MP and 5MP images; both looked quite sharp and crisp. On occasion, the 16MP images appeared marginally sharper. I found this camcorder’s controls mostly easy to use. Its front-panel controls are sensibly laid out. Their arrangement is simple and uncluttered— a small four-arrow directional pad ringed by four buttons. I got up to speed on the basics after a half-hour of poking around, no manual needed. The 2-inch screen is small even for pocket camcorders, but I quickly wended my way around the screen menus, and a helpful status bar gave me useful info, like what resolution I was shooting in and how much battery life remained. Elsewhere you find only three other buttons, the on/off button on the top panel, and a pair of buttons on the left panel to turn the low-light video light on and off, and to upload video clips and pictures. The Upload button works only for Windows systems. The Camileo B10 comes with the usual pair of connectors, a miniUSB port for file uploads and battery charging, and a miniHDMI port so you can play your video on a TV screen. The Camileo B10 hummed along for nearly two hours in our battery run-down test, during which we continually recorded Full HD video. Most users will find this battery life to be plenty long enough for their needs. You can expect to get three to four hours on a charge in typical use, a mix of shooting, previewing, and uploading files to your computer, with down-time in between. It took me a little over seven hours to recharge the lithium-ion battery off my computer, but I cut that time in half when I used the optional AC-power USB charger ($15). Add an extra battery pack ($20), and you can squeeze almost a full day of shooting out of this unit. The Camileo B10 is one of the first pocket camcorders I’ve seen that supports 64GB memory cards—most of its peers max out at 32GB. But that’s not as big a deal as it sounds. 64GB cards are very pricey, costing as much as the camcorder itself, and you can buy a pair of 32GB cards for much less money. On the down side, the unit comes with virtually no onboard memory. If you buy this camcorder, make sure you shell out extra for an SD card. To shoot Full HD video, we recommend a minimum 4GB Class 4 card. With the Camileo B10, Toshiba bundles ArcSoft’s MediaImpression HD media file manager, and a very basic onboard file-transfer utility called Camileo Uploader. Neither of them runs on a Mac, but I found it easy to whisk my files into iPhoto and iMovie on a Macbook Pro, using the supplied USB cable. If the Camileo B10 were more solidly built, and would simply start up each time we pressed the Power button, we’d have considered it a good choice for budget-minded people who do a lot of full-light shooting. As is, we think most shoppers should give it a pass. If you are thinking of buying this camcorder, make sure you get a solid money-back guarantee and put this unit through its paces during the refund period. Otherwise, for a very small pocket model that shoots good video, consider Kodak’s PlaySport Zx3. It costs $30 more, but it’s ruggedized and waterproof, and comes with an AC adapter for fast battery charging.